Jose Rene Almendras belongs to the innermost of President Benigno Aquino III’s inner circle of classmates, schoolmates and buddies from Ateneo de Manila University that hangs out with the bachelor Chief Executive at social events and after work, or travels with him on his foreign trips. Almendras leads an exclusive trio in this inner circle that includes Cristino Naguiat Jr., the chair of the Philippine Amusement and Gaming Corp. (Pagcor) and Romy Mercado, whose family used to own Red Ribbon Bakeshop until it was bought by Jollibee Foods Corp. in 2005. One of the President’s chums, who asked not to be named, said the Almendras clique has become a source of envy among the President’s other friends and political allies for the way it has “barricaded” itself around the President to the exclusion of others. Of the three, only Mercado does not hold a government post—and only because of questions about his citizenship, the source said. Almendras did not respond to requests for an interview for this article. The Almendras clique has been dubbed the “Apo Hiking Society”—a reference to the popular 1970s pop trio, also from Ateneo—for the way they would regale the President during karaoke sessions with their medley of the top hits of their college days. Mr. Aquino keeps his social circle tight and he apparently enjoys being with the Almendras group because he is known not to want to spend even a minute with anyone he does not like, particularly when he wants to relax, explained another friend close to the Almendras group. “[But] is being close to the President enough to be appointed a power broker in Malacañang after failing to generate power in his previous job?” asked the jealous presidential chum. That “power” dig refers to the latest manifestation of Mr. Aquino’s perceived partiality for Almendras. Almendras, who was president of Manila Water when Mr. Aquino appointed him energy secretary in 2010, was deemed to have performed disappointingly at his new job when he failed to adequately deal with the worsening power crisis in Mindanao earlier this year and his exit was widely anticipated. During the Mindanao power summit in April, Mr. Aquino said it was unfair for some people to make Almendras their “favorite whipping boy” for the high fuel prices burdening the country and the daily blackouts buffeting Mindanao. On the advice of Almendras, the President said the solution was for the residents and businessmen of Mindanao to pay more to get a stable and sufficient power supply. This decision was widely criticized and fueled calls for the replacement of the energy secretary. It also fanned rumors that the President was looking to move Almendras elsewhere. Six months later, Almendras was appointed to the now revitalized position of Cabinet Secretary, which some pundits claimed was Mr. Aquino’s way of accommodating his friend. However, this was deemed as having been done at the expense of another close friend, Executive Secretary Paquito Ochoa Jr., a claim that Malacañang mouthpieces adamantly denied. It has been pointed out that Executive Order No. 99, which Mr. Aquino signed on Oct. 31, will transform the Office of the Cabinet Secretariat from a mere facilitator of information in the Palace and integrator of the President’s initiatives as envisioned originally in its creation in 1986, into a pumped-up office of the Cabinet Secretary. With the vastly more powerful office, Almendras can identify the priority areas in Mr. Aquino’s Philippine Development Plan, realign targets and represent the President at meetings or events; sit in all Cabinet cluster meetings and join the National Economic and Development Authority (Neda) board executive committee and subcommittees on infrastructure, social work and investment; compel all state agencies and corporations to provide data and assistance to the Cabinet Secretary; and directly report to the President and run the Presidential Management Staff (PMS) and the Performance and Projects Management Office. 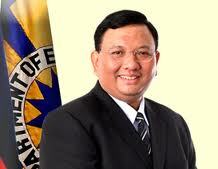 “Anybody that close to the President will be powerful,” said Nueva Ecija Rep. Rodolfo Antonino. He is a technocrat in a political position, said this Senate source, pointing out a similar misfit in the appointment of Leyte Gov. Jericho Petilla and Transportation Secretary Joseph E.A. Abaya, politicians who were plucked out near the end of their 9-year elective posts to manage the largely technocratic energy and transportation portfolios, respectively. The source believes that Almendras probably lacks the political savvy to thrive in Malacañang’s “snake pit,” having spent most of his professional career at the top of some of the country’s Top 100 corporations. But Sen. Gregorio Honasan sees Almendras’ appointment in a different light, saying the President has made an intelligent choice. “I think Secretary Almendras is an inspired move by the President, to appoint a management expert like him for a political job. I think he will provide the Palace with more stability and the President with more focus on what needs to get the job done with as little politics as possible,” Honasan said. Aside from the presidency of Manila Water, which he assumed in 2009, Almendras also occupied key posts in various corporations during the nearly three decades he spent in the private sector. He was a member of the management committee and concurrent head of the Visayas Mindanao Business and Operations Transformation Group. He was also President and CEO of Cebu Holdings and Cebu Property Ventures and Development Corp., both parts of the Ayala Land Group. Almendras also served as treasurer for the Aboitiz Co. and Aboitiz Equity Ventures. An acknowledged international resource person on sustainable development, Almendras earned his business management degree from Ateneo de Manila University and completed the strategic business economics program at the University of Asia and the Pacific. Antonino does not agree that Ochoa’s role would be diminished with the entry of Almendras into Malacañang. “His (Almendras) job is to ensure administrative efficiency in the implementation of the policies and programs of the President,” he said in a text message. A source close t Ochoa said the so-called little president has welcomed the entry of Almendras and dismissed speculations of any rivalry between two of the President’s closest friends. “Let’s just see how it unfolds,” said House Speaker Feliciano Belmonte Jr., another one of the President’s allies. According to House Minority Leader Danilo Suarez, being neither with “Balay” or “Samar”—the two warring factions around the President, so named for the divided and separate campaign headquarters of Mr. Aquino in the 2010 presidential campaign—Almendras would serve as a sort of “watchdog” inside the Palace.